I always take my video camera with me when I go out of town. Or I at least try to. That doesn't mean I use the entire time I'm gone, though. I took it with me every time Cherem went on tour, but it would spend 90% of the trip in the camera bag under the second bench. I would be all about it for the first day or two, but then I'd get sick of carrying it. 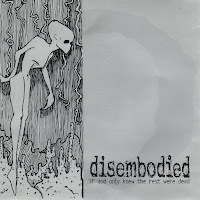 Last June, we went to California to see a band called Disembodied play a reunion show (The album pictured to the left is on my Top 10 records of all time list, by the way). There were about 10 of us on one flight and nearly two dozen more that drove down separately. I tried to take as much video as I could, but didn't get much. When I got back home, I immediately transferred all the footage to my computer and forgot about it soon after. I started cleaning up my hard drive this weekend and found it, so I threw it all together and released it to the Internets. There wasn't a whole lot to work with, but I think it turned out reasonably well. And it will be fun for me to look back at in a few years. Probably won't be as much fun for anyone that isn't in the video. I shot the first hour or so we were there on Friday, didn't shoot anything on Saturday and I ran out of tape at Disneyland on Sunday. This is what I was able to get out of that. Enjoy!